This weekend I followed a discussion where someone had the confidence to post online a brief description of an incident where it ended well but there were opportunities for improvement. However, as in the majority of cases like this, the discussion descended into name calling and ‘my agency is better than yours’ comments being made which doesn’t help anyone and actively reduces the likelihood of others talking about their mistakes, errors or close calls. Learning from incidents is a subject that comes up many times, and to be sure, it is one of the most effective ways of improving performance. However, in diving it is very difficult for a number of reasons. To start with, there isn’t a clear definition of what an incident is. Many consider it to be a fatality or serious DCS, and others (including myself) determine an incident to be where something didn’t go to plan and there could be something to learn from it. That learning isn’t just for you, but the wider community. Fatalities have a number of unique factors which come together, unseen by the victim. Isolating those is incredibly difficult. Learning from non-fatals is much better, not least because you have those involved available to talk about it! Secondly, there is an immature Just Culture. This means that divers are very quick to judge others by their own standards (which may be ‘wrong’, or just different) and negatively criticise actions, decisions or configurations because they don’t conform or they don’t understand the decisions made. Rather than putting themselves in the shoes (or fins!) of the other diver, thereby considering their experience, knowledge and cultural exposure they just judge. e.g. 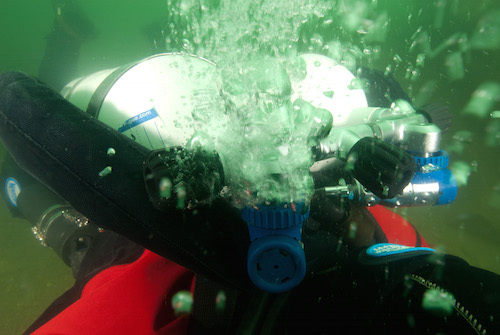 if the group of divers that the subject diver normally dives with are used to unplanned separations, and they don’t surface when that happens and nothing goes wrong, don’t be surprised when the subject acts that same way. Or if their peers don’t do checks before getting in the water, and something is missed, but nothing goes wrong, why be surprised when they don’t do checks. In more recent times, ‘human error’ is considered a post-event judgement which is needed for social and cultural reasons. However, it shouldn’t be considered the end, rather just the start of the process to understand how and why the situation developed in the manner it did. Next, there is a poor Learning Culture within the community. This is about wanting to learn from others, or providing learning opportunities for others to learn from your mistake, and again is linked to Just Culture – if people are going to throw rocks at you for talking about your mistakes, you need to have a pretty thick skin to keep on doing it! The majority of training agencies are not good at teaching their students to be reflective, both on the course under the tutelage of their instructor, or when they are diving on their own, therefore they don’t get used to critical feedback. Telling someone is great on their dive is good to start with to build their confidence, but ultimately to improve, they need to have detailed feedback which might mean telling them they were rubbish, and then asking them to think through why this might be/was the case. Finally, there is an absence of a good Reporting Culture. None of the training agencies actively promote incident reporting throughout their training programmes. Whilst you may share your ‘incident’ and the way you dealt with it with your immediate friends, what about all the other divers out there who may make the same decisions as you. Wouldn’t it be a good idea to share that learning knowledge? Again, linked to Just Culture because many people are afraid of having their mistakes criticised by ‘arm chair divers’ even if there is something positive to come out of the discussion. Yes, learning from incidents is a great way to develop, but there are some major obstacles that need to be climbed over first. Those obstacles can be breached from the bottom up, but a more effective way is to get the agencies to start delivering these concepts as part of their training programmes. You can improve things yourself by considering three simple questions after each dive and answering them honestly. What went well? Focus on the stuff that worked. If it worked, why change it, but also consider that it might be improved. Even some training agencies engage in the blame game. If an instructor self-reports an minor incident or paperwork error, they will put them under the QA microscope for an extended period without discussion. I don’t think it is an agency problem, I think it is an instructor problem. Most instructors I know consider themselves infallible dive gods. A great number of them have difficulty managing their trim, or fail to properly answer the more profound questions about anything decompression related. Basically a majority of instructors are walking besides their shoes.